Staying on top of your oral health will reduce the risk and cost of more complicated repairs in the future. With regular dental checks to examine your teeth, mouth and gums your dentist is able to help maintain a healthy mouth, screen for signs of other problems and discuss any recommended treatments. As a busy dental practice we have the facility of a hygienist for your routine scale and polishes and any oral healthcare needs. The hygienist can detect tell tale signs such as bleeding or receding gums, which can be identified and carefully monitored. In addition to checking and updating your medical history records our hygienists will assess the health of your gums and offer advice on caring for your teeth on an effective day-to-day basis. We recommend all our patients receive regular professional dentist or hygienist scale and polish treatments to remove the build up of deposits and plaque from the teeth that normal ‘at home’ brushing cannot remove. Thanks to our new Airflow treatment patients no longer have to live with stained teeth. Designed to remove simple tooth staining from everyday things such as drinking tea, coffee, red wine and smoking, Airflow can significantly improve the brightness of your teeth. By using a combination of air, sodium bicarbonate and a jet of water, our state-of-the-art treatment will have your teeth looking brighter. At Dentistry442 we ensure to put your mind at rest by fully explaining the process of a tooth extraction before your appointment. We follow a simple procedure to anaesthetize both the tooth that will be extracted and the surrounding gum and bone to ensure the procedure causes minimal discomfort. We also take the time to talk you through post-operative instructions so that you can continue aftercare at home. More and more patients are choosing to repair damaged or heavily filled amalgam teeth with white fillings (Composite Resins). 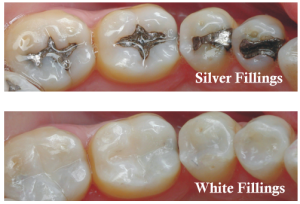 As a safer option to amalgam fillings, white fillings are an excellent way to improve aesthetics.